† Sizes contained within product names are approximate, for guidance purposes only. Please check individual product pages for more information. All products are suitable for domestic use only. Photographs, Videos, and illustrations are for illustrative purposes only. Accessories if shown are not included unless otherwise stated in the product description. Specifications, Weights and Dimensions may vary slightly. 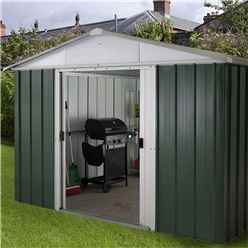 Shedswarehouse Ltd reserve the right to supply products which may vary slightly from the products listed.